Noyers (full name Noyers-sur-Serein) is a village in the pretty setting of the Chablis countryside on the banks of the River Serein, south-east of Auxerre in the Yonne department of Burgundy, and is officially listed as a 'most beautiful village of France'. 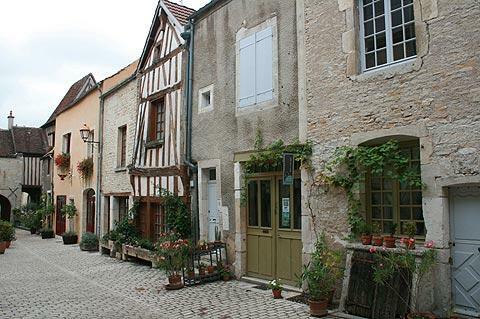 Noyers is a very attractive village with a well-preserved 15th century medieval centre which, despite the presence of a couple of small supermarkets, successfully creates the impression that you have entered into another era. You will enter the village through one of the 19 of the original 23 fortified gates and towers that are still standing and give access to the town centre. 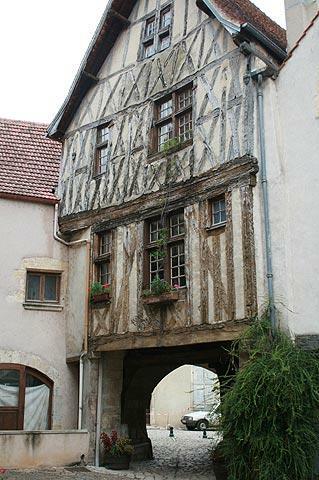 Inside the walls you will discover numerous traditional colombage and stone houses. Here inside the walls you can simply stroll along the cobbled streets, each as impressive as the next, with the half-timbered old houses bending under the weight of the centuries. 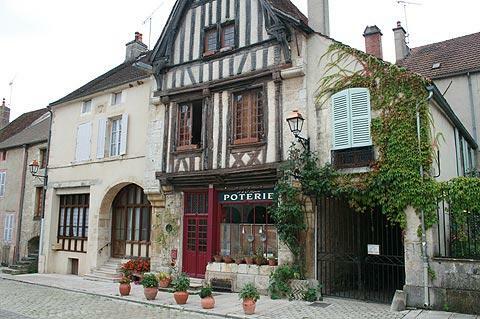 There are also a selection of cafes and a small number of gift shops in the centre of Noyers-sur-Serein. 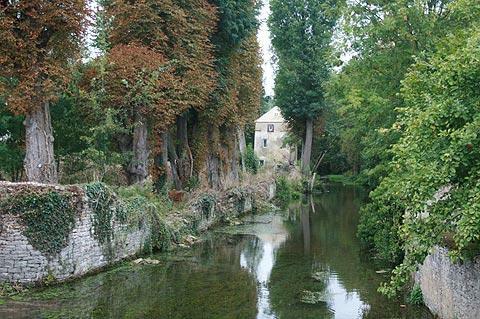 Buildings of particular interest in Noyers include the 17th century town hall with its ornate baroque style facade, the 15th century church of Notre-Dame with a square tower decorated with gargoyles, the 19th century lavoir (public linen washing area) and the remains of a castle. In total there are 78 classified historic monuments in the town! The church is not quite in the medieval centre, but is close by. This is unusual, because in most medieval settlements the church is at the heart of the village. 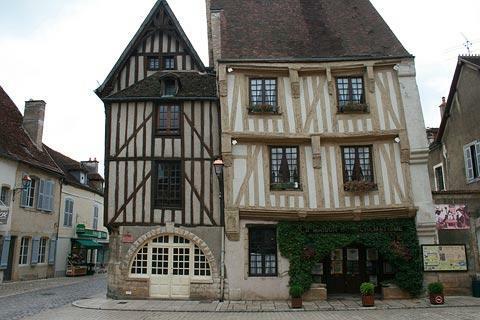 Perhaps the centre of Noyers has moved a little over the centuries? The church is still within the fortifications. The enjoyment of a visit continues outside the fortified walls where you can walk along the river bank to see the remains of the old castle, and also get a different perspective on the town itself - along with the chance to see more beautiful buildings poised above the ramparts. Also outside the ramparts, to see the lavoir (and a very scenic view along the river) walk straight out along the road from the main town entrance gate. There is also an important museum of Naive Art in Noyers-sur-Serein. 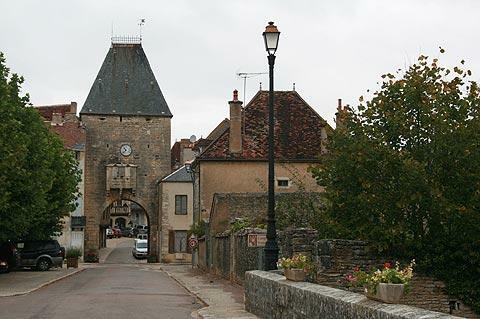 The rolling countryside around Noyers contains many picturesque villages, towns and historic monuments: for example Montreal to the south of here and Chablis to the north-west. 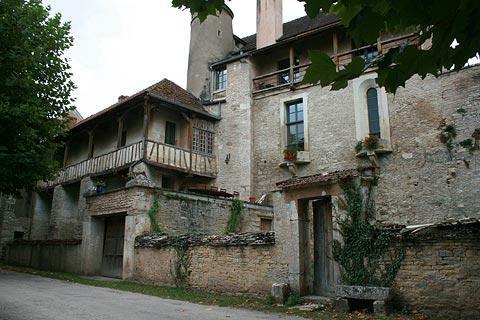 A little further and among our personal favourites are the abbey at Fontenay and the small town of Semur-en-Auxois. 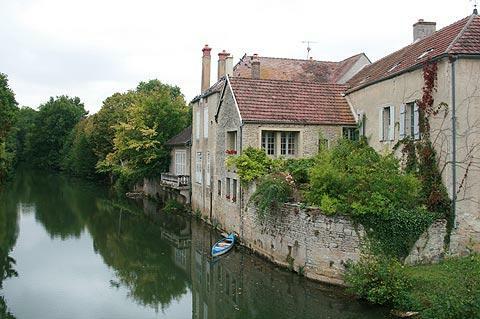 You can find more local travel ideas in the Yonne guide and the Burgundy guide.